Peacefully, Saturday, December 22, 2018 at the age of 84. 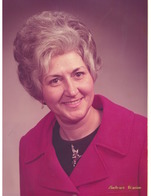 Beloved wife of the late Ellwood Pritchard. Dear stepmother of Patti (Bob DuPerron). Proud Nanny of Matt (Beta Yadollahi), Adam (Sarah) and Dana (Paul Willetts) and great-Nanny of Zoey, Audrey and Georgia. Loving sister of Roger (Rachelle), Jean Church (Ken), Lyla Martel (the late Buck), Joan Grant (the late John) and predeceased by Jerry (the late Gert), June Salway (the late Lorne) and Lyle (Lorraine). Fondly remembered by many nieces, nephews, family and friends. Friends are invited to visit at the Central Chapel of Hulse, Playfair & McGarry, 315 McLeod Street (at O’Connor) on Friday, January 4th from 2-4 & 6-8 p.m. and on Saturday, January 5th from 10 a.m. until the time of the Service at 11 a.m. Reception to follow. In Memoriam donations to the Canadian Diabetes Association or to the Heart and Stroke Foundation appreciated.